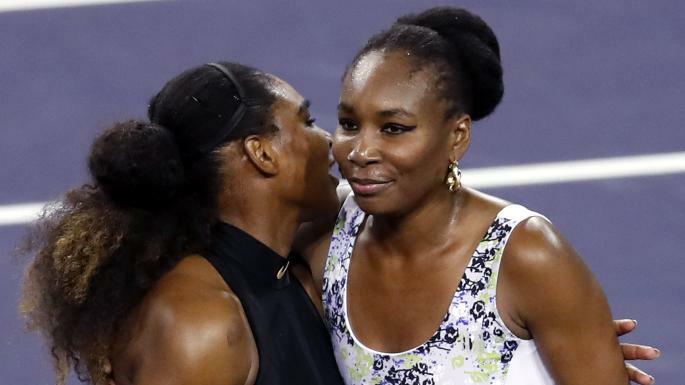 Venus Williams called her lucky for playing more matches than her sister Serena. But that is only for the ongoing Indian Wells. The elder of the two sisters came out on top after beating Serena 6-3 6-4 in the third round of the tournament in a match saw some top class tennis, and probably the best, between the two sisters. The two sisters resumed their rivalry, which began in second round of Australia Open 1998, on Tuesday in the third-round with Serena holding a 17-11 head-to-head record and having won eight of the last nine matches. But Venus was not letting that happen on Tuesday. In what is her first win over Serena since 2014, Venus took close to one hour. Serena saved the first match point but she then send a service forehand return long. On a night Serena made 41 unforced errors, this was her 17th on the forehand side. This was Serena’s first WTA tournament after giving birth to her daughter. She was out of competition due to her pregnancy for 14 months during which she married Reddit co-founder Alexis Ohanian, who sat courtside. Venus and Serena exchanged holds for the first five games of the match but it was the former who got the first break and she then took a 5-3 lead in the set before holding her serve to win the first set 6-3. Serena was clearly wary in the second set and could not repeat the start she had in the first. She was down 0-3 but then made a small comeback to make it 2-3. Just when it looked Serena will pave her way back, Venus did not let her. Serena did hold the serve on the ninth game of the second set and saved a match point. But Venus then served out the match to win it 6-3 6-4 and cut short her sister’s return to the WTA Tour. The two sisters did a one-handed hug at the net after the game but none smiled. This is the first time the two met at Indian Wells, a match was in the making for 17 years. Back in 2001, the Williams sisters were supposed to meet in the semi-final but Venus pulled out moments before the match. The crowd at Indian Williams booed Venus and her father Richard Williams. Serena was also booed in the final against Kim Clijsters, a match she won. As a result, both sisters boycotted the tournament for 14 years. That exile was ended by Serena when she returned to the tournament in 2015 but withdrew with a knee injury before her semifinal, and Venus followed the next year.